Al Gore is very smart. Al Gore is still a goober of the highest order. I believe global warming is real and likely problematic. I believe humanoids are at least partially to blame. 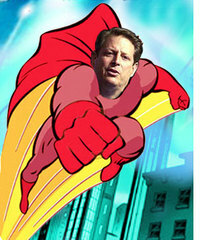 I do not believe Al Gore’s crusade will work. As I said, I think it’s a film that’s worth seeing if (a) you like films, (b) you like documentaries, (c) you have any real interest in environmental issues, or (d) you think Al and his whole lot are a bunch of liberal Chicken Littles. Actually, if you’re in that last camp you may have the most to gain from watching it, but you’re probably not going to do so no* matter what I say. And if that’s you, way to be that guy. I contend that it’s worth seeing for a couple of reasons. First, it’s just a very effective visual production. I’m not an expert in these things but, as in so many areas of my life, I have friends who are, so I’ve picked up just enough knowledge to be annoying in my efforts to act like I know what I’m talking about. To that end, I contend that this is a very well conceived piece of film. It is well written and assembled in such a way that you’re rarely given too much science at once without a break for more personal vignettes. 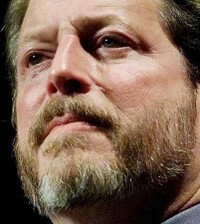 Some of you will hate that because those vignettes are stories about Al Gore’s life. Sure some of it is schmaltzy and manipulative, and I felt like Al was whispering in my ear a bit too much, but overall I actually enjoyed that dynamic. It’s a shame (for him anyway) that Gore couldn’t humanize himself for the masses back in 2000 the way he does in this film. He might not have been free for film making if he had. The second reason I recommend the movie is that it is an accessible presentation of the basic science of global warming and the arguments for the "we should do something about this" position on the issue. Whether or not you agree, you’ll get a more cohesive and accurate sense of the real case for human-induced-and-preventable-warming than you get from, say Bill O’Reilly, Al Franken, or the Gyllenhaal kids. Gore will not be perceived as an objective source on the environment and the movie won’t change anyone’s mind about that. Big deal. Objectivity is mostly a myth anyway, and watching this movie doesn’t prevent you from researching the opposing arguments. 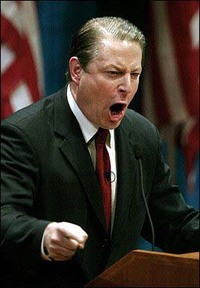 For a non-scientist, Gore probably has as much credibility on this particular issue as anyone. He’s been paying close attention to the study of warming for a long time, and that counts for something. I don’t agree with Al about many things, but I admire his intensity, tenacity, and use of his intellectual capacities. And, as I said, I think he’s done a remarkable job of remaking himself since he ran for president as a robot with a lock box seven years ago. the science: Of 928 peer reviewed scientific articles about global warming sampled, exactly zero were in doubt as to their being a significant human component to current warming trends. Of 636 articles about warming sampled from the popular press, 53% suggested significant scientific doubt or controversy over the cause of warming. The most common objection I’ve heard to the campaign to do something about warming is that there isn’t scientific consensus on the issue — that warming is cyclical and that there is no real evidence that what’s happening now is anything more than a natural fluctuation. I’ve probably even made that statement based on scant personal knowledge a few times. That seems unlikely at this point. There is almost universal consensus among the scientific community that (a) the earth is warming, (b) there is no precedent in the known scientific record of either the level or rate of warming happening now, and (c) there is substantial evidence to suggest human activity of the last several decades is the cause of this spike. Let it be said that scientists aren’t always right, even when they agree. But this is what it is. There are certainly still dissenters, but they are a shrinking minority. I’ve been surprised to read and see so many accounts of scientists who doubted or vehemently opposed these theories about warming for years and now have changed their minds. more than liberals, and the media (speaking in very broad terms, obviously) certainly does tend to push more "liberal" causes without much hesitation. Yet here we have the opposite — the popular media continuing to drive an apparently inaccurate perception about the science of warming and many fairly conservative folks running with that perception. Weird. For the record, I have no particular interest in Al and his pals being right. I hope they’re wrong. I just think there’s less scientific basis for thinking they’re wrong than before. That’s all. And I’m certainly not trying to champion Al in some way, but that will be clear enough soon enough. Al somehow gets away with calling the folks displaced by the 2004 Tsunami and Katrina "refugees." I assume Jesse Jackson is out there running a boycott of the DVD and that he organized protests of the premiere, the Oscars, etc. Right? ……no? Hmm. warnings will produce some kind of change in how we live as he walks through about the fifth airport we’ve seen in the film to get on what I can only assume was his billionth flight in a year or so. Is Christopher Guest ghost-writing parts of this thing? This is one of several moments like this I notice in the movie — commentary on how desperately we need to decide to live differently while we’re watching Al live just like we all live (or just like he lives, which is not necessarily how "we" live). I know hypocrisy is too easy to find in anyone with a cause, and I know we use it as a crutch for our paralysis and indifference far too often. Let that be said. However, this has to start somewhere, right? If we want less of the stuff in the air that causes the earth to warm, we probably need to fly around on fewer big jet planes and drive around in fewer limousines, right? Does Al really want to sit across a table from me and start comparing how much heat I’m giving off to his output? According to this report, I’m guessing the answer is no. And that goes for all the hosers in Hollywood going on late night talk shows and congratulating themselves for driving cars powered by vegetable oil and hemp root mixed with their own urine (though if someone can invent that kind of engine, I am absolutely in — talk about killing two birds with one stone!) Most of these nuts have flown more miles in the last month than I’ll fly my entire life, many of them on private jets lest they have to mingle with the unwashed plebeians who still drive archaic autos powered by evil fossil fuels. Their "cribs" consume more energy in a month than my home and yours will use for the next year. Look, if I understand this correctly, Gore is arguing that we have to take warming seriously and start changing the way we live. That means change the way we live, right? That means this is so important that, rather than justifying the way I live, I need to change it, right? Consume a reasonable amount of energy, right? So what’s the hold up, Al? How important is it? How much do you believe this? Do you believe it enough to live differently? Do you believe it enough to live like me and most of my relatively environmentally unconscious friends live? And that’s the problem. Al may be right about the predicament, but we have a major breakdown when it comes to a solution. Why? If this thing might do us all in, why is the guy who’s become the face of the issue using 20 times the energy (none of it powered by the sun or cow manure, as far as we can tell) at his house that I am at mine? I mean, his kids are grown and out of the house, right? It’s just him and Tipper hanging around the joint when they’re home, I assume, and surely they’re home less than most of us (not that we aren’t all on the global speaking circuit or doing press junkets to support our award winning film). So what gives? I’ll answer that in a day or three. It’s not really about Al. *I noticed when reading this back that I constructed a phrasing with four consecutive two letter words ending in "o." Now that’s something to make a film about.